One of the ways that I recommend my patients detoxifying their body is by doing oil pulling. Oil pulling was started in ancient China and was traditionally done with sesame oil. I recommend that you do it with coconut oil. Coconut oil has anti-infectious properties and is much higher in Omega-9’s versus Omega-6’s, which sesame oil has. Everyone has toxins in their body to some degree and these need to be eliminated or reduced from several sources that are made by the body. The other source of toxins is the ones that you get from outside the body such as in the food you eat, the air you breathe, and the water you drink. The are the sources that concern me the most as many of these chemicals were not even around 50 years ago and our bodies have no way of detoxifying them, let alone eliminating them. Therefore, we have to help our body out by doing various things that aid in detoxication. Oil pulling is one of these detoxification methods that is easy to do! First, take a mid-sized tablespoon of coconut oil and put it in your mouth. Swish it around aggressively for about 20 minutes and then spit the coconut oil in a trash bin. It is important to not spit the coconut oil out prematurely during the swishing process as it is during this process that a significant amount of toxins is absorbed that are found in the mouth. It is also important to not spit out the coconut oil into your sink as as coconut oil quickly hardens as it cools down and can clog your pipes. What I do as I get up in the morning is brush my teeth and then take a spoonful of coconut oil in my mouth. Afterwards I spend the time I am in the shower, shaving, and putting on lotion to perform the swishing action that we discussed earlier. This allows me more than enough time for proper detoxification. There are many other ways that you can detoxify the body such as skin brushing, various herbs, as well as an ionic cleanses that are available at our office. Oil pulling is on of the most convenient and easy ways that you can make significant changes in the toil cloud that your body is experiencing. 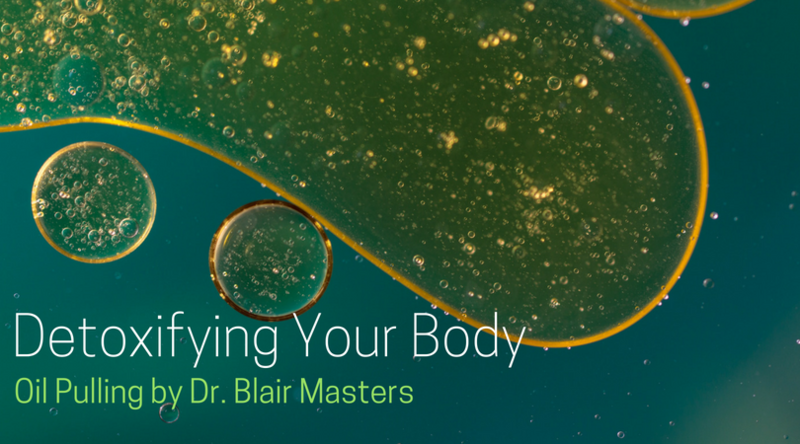 For more information on how you can detoxify your body, schedule a free health consultation today!